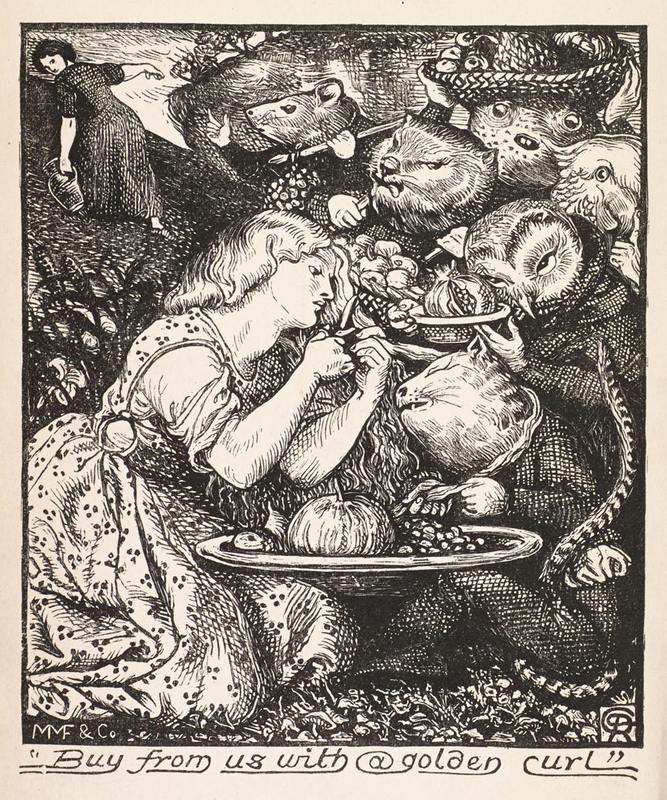 Dante Gabriel Rossetti’s frontispiece, complete with wombat, for his sister Christina’s long poem Goblin Market, which includes the line “One like a wombat prowled obtuse and furry” — Source. Piece originally published at Public Domain Review under a Creative Commons Attribution-ShareAlike 3.0 license. These soon vanished because, of course, when the frescoes were finished the whitewash was removed. Edward Burne-Jones was supposed to have done the best ones, and he continued to produce them for many years. A rather overheated Egyptological example, shown whizzing past the pyramids, was much later chosen by Lady Burne-Jones as an illustration for the part of her memoir that dealt with the Oxford Union episode. Wombat sketch by Edward Burne-Jones featured in Memorials of Edward Burne-Jones (1904) by Georgiana Burne-Jones — Source. Of course, the Pre-Raphaelites were not the first English to become enamoured by the unusual creature. Wombats captured the attention of English naturalists as soon as they found out about them from early settlers, explorers, and naturalists at the time of first contact. The Aboriginal word wombat was first recorded near Port Jackson, and though variants such as wombach, womback, the wom-bat and womat were noted, the present form of the name stuck very early, from at least 1797. Beautiful drawings survive from the 1802 voyages of the Investigator and Le Géographe. 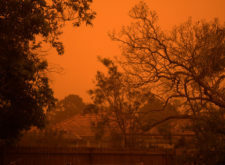 Ferdinand Bauer, who sailed with Matthew Flinders, and Charles-Alexandre Lesueur, who was in the rival French expedition of Nicolas Baudin, both drew the creature. These were engraved and carefully studied at home. Wombats were admired for their stumpy strength, their patience, their placid, not to say congenial manners, and also a kind of stoic determination. Occasionally they were thought clumsy, insensible or even stupid, but these isolated observations are out of step with the majority of nineteenth-century opinion. 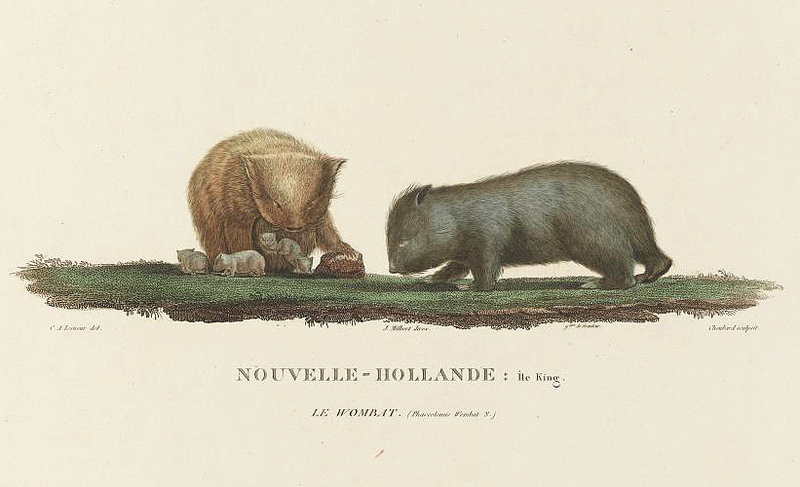 Engraving of wombats after a drawing by Charles-Alexandre Lesueur, plate 58 in the Voyage de Découvertes aux Terres Australes (1824) by Arthus Bertrand — Source. From about 1803, a steady trickle of live wombats reached Europe. We know there was a wombat among the birds and animals that were delivered to the menagerie of the Empress Joséphine Bonaparte at Malmaison, near Paris. Another early wombat owner was the English naturalist Everard Home, whose paper on the subject, “An Account of Some Peculiarities in the Anatomical Structure of the Wombat“, appeared in March 1809 in the Journal of Natural Philosophy, Chemistry and the Arts. Home’s wombat, a male, was in fact caught by George Bass, probably on King Island, where we know Bass and his companions shot several other specimens. Once provoked, this particular wombat put up a splendid struggle, tearing strips off Bass’s coat sleeves and making loud “whizzing” noises. Evidently he took ages to calm down. Bass kept him alive, looked after him well, and sent him to England. There, in London, he lived in what Home described as “a domesticated state for two years”. The following description is no less charming today than it must have been for English scientific readers nearly two centuries ago. [The wombat] burrowed in the ground whenever it had an opportunity, and covered itself in the earth with surprising quickness. It was quiet during the day, but constantly in motion in the night: was very sensible to cold; ate all kinds of vegetables; but was particularly fond of new hay, which it ate stalk by stalk, taking it into its mouth like a beaver, by small bits at a time. 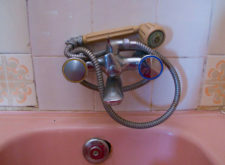 It was not wanting in intelligence, and appeared attached to those to whom it was accustomed, and who were kind to it. When it saw them, it would put up its forepaws on the knee, and when taken up would sleep in the lap. It allowed children to pull and carry it about, and when it bit them did not appear to do it in anger or with violence. Some misconceptions lingered for decades. In 1827 an engraver working for the museum in Newcastle had the wombat sitting up like a kangaroo, something that clearly escaped notice throughout the galley and page-proof stages of publication. But the most important development in the establishment of the wombat’s English reputation was the appearance in 1855 of John Gould’s de luxe The Mammals of Australia. 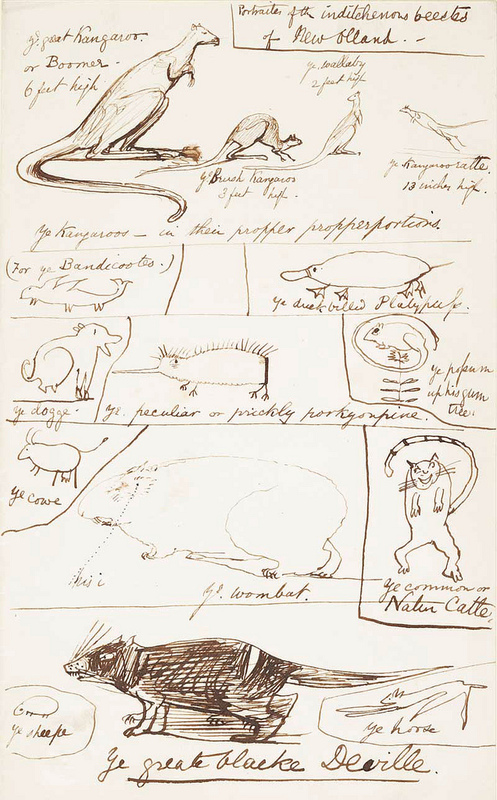 Gould was in Australia much earlier, in the 1830s, and it was certainly through Gould that the artist Edward Lear, who illustrated Gould’s Birds but unfortunately not the Mammals, made a wonderful sheet of whimsical drawings of the “Inditchenous Beestes of New Olland”, a rarity which is today in the collection of the Pierpont Morgan Library in New York. These are plausibly accurate caricatures of various species of kangaroo and wallaby, the platypus, the “possum up his gum tree” and the Tasmanian Devil. There are also mad renderings of the bandicoot, echidna, and native cat, not to mention representative appearances in the margin of the cow, the dog, the sheep, and the horse. Splendidly rotund and occupying the largest amount of space towards the bottom centre of the sheet is the wombat, with “his i”. Portraites of the inditchenous beestes of New Olland, undated drawing by Edward Lear, though likely sometime during 1831 to 1837 when the artist spent many months at a time recording the contents of the thirteenth Earl of Derby’s famous menagerie at Knowsley, near Liverpool — Source. Gould’s 1855 description of the wombat is almost as captivating as Everard Home’s fifty years earlier. 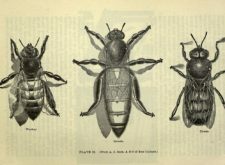 In its habits it is nocturnal, living in the deep stony burrows excavated by itself, during the day, and emerging on the approach of evening, but seldom trusting itself far from its stronghold, to which it immediately runs for safety on the appearance of an intruder. 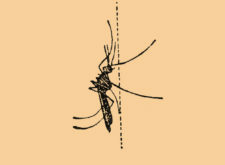 The natives state, however, that it sometimes indulges in a long ramble, and, if a river should cross its course, quietly walks into the water and traverses the bottom of the stream until it reaches the other side … In its disposition it is quiet and docile in the extreme, soon becoming familiar with and apparently attached to those that feed it; as an evidence of which, I may mention that the two specimens which are now and have been for a long period living in the Gardens of the Zoological Society in the Regent’s Park, not only admit the closest inspection, but may be handled and scratched by all who choose to make so intimate an acquaintance with them. If not from Thomas Woolner, whose view of the Australian landscape was pretty bleak, Rossetti and his friends may well have derived their particular enthusiasm for wombats from Gould’s or some other appealing description. Or maybe they simply fell in love with the wombats at the Regent’s Park Zoo. 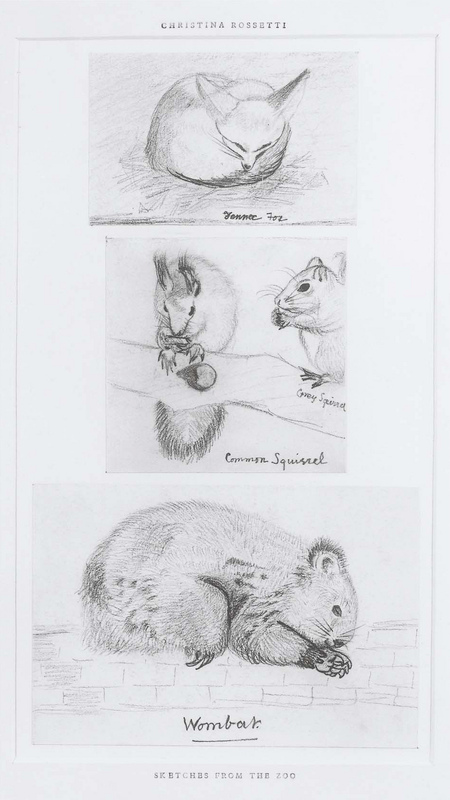 Sketches from the zoo (presumably Regent’s Park) by Christina Rossetti, including, of course, at the bottom a wombat, ca. 1862 — Source. Earlier, in 1862, Rossetti had moved to Tudor House, at 16 Cheyne Walk, Chelsea. Spacious, with plenty of room for family and friends including George Meredith and the poet and semi-professional sadomasochist Algernon Charles Swinburne — who liked to slide naked down the banisters — the house had four-fifths of an acre of garden, with lime trees and a big mulberry. As soon as he arrived, Rossetti began to fill the garden with exotic birds and animals. There were owls, two or more armadillos, rabbits, dormice, and a racoon that hibernated in a chest of drawers. There were peacocks, parakeets, and kangaroos and wallabies, about which we know frustratingly little. There was a Canadian marmot or woodchuck, a Pomeranian puppy called Punch, an Irish deerhound called Wolf, a Japanese salamander, and two laughing jackasses. We know the neighbours were tolerant up to a point but Thomas Carlyle, for one, was driven mad by the noise. At length there was a small Brahmin bull that had to go when it chased Rossetti around the garden, and, in September 1869, a long-awaited wombat, the culmination of well over twelve years of enthusiasm for the exotic marsupial. Shortly before this date there had been a number of animal deaths at Cheyne Walk, so Rossetti raised the animal-collecting stakes considerably. In November 1867, he was negotiating with his supplier of wild animals, Charles Jamrach. His object was to purchase a young African elephant, but he balked at the price of £400. Rossetti’s income for 1865 was £2000. 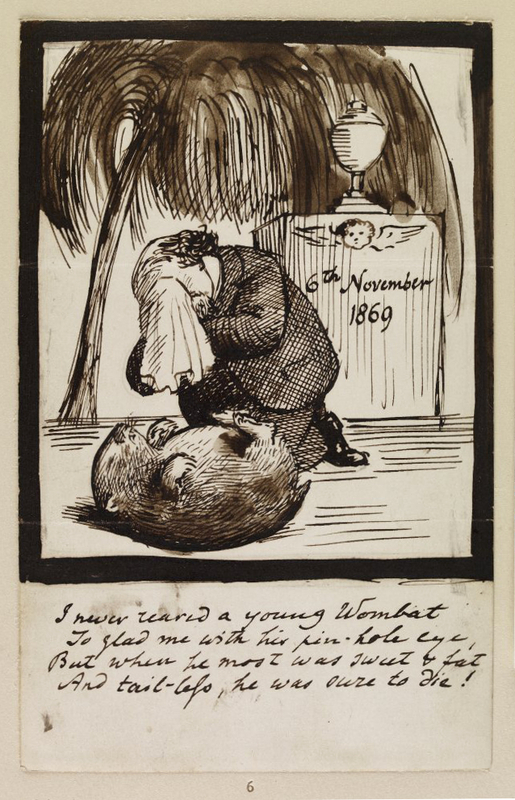 Rossetti finally arranged to buy a wombat, again through Jamrach, when at length a suitable specimen became available. This wombat arrived when he was away in Scotland recovering from a kind of breakdown, largely precipitated by failing eyesight, insomnia, drugs, and above all his growing infatuation with Jane Morris, the wife of his old friend and protégé from the Oxford Union days. 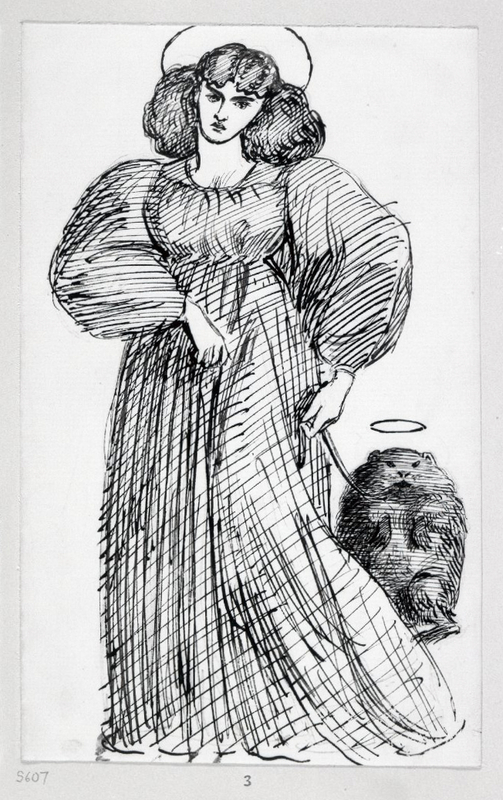 A remarkable drawing of Jane Morris and the wombat in the British Museum illustrates the degree to which lover and pet merged in Rossetti’s mind as objects of sanctification. Each of them wears a halo. But Jane has the wombat on a leash, and it seems clear that Rossetti also used his pet wombat as a cruelly comical emblem for Jane’s long-suffering, cuckolded husband. Since university days William Morris was known to his friends as “Topsy”; the name Rossetti chose for his Wombat was “Top”. Drawing by Dante Gabriel Rossetti of Jane Morris and Top, 1869 — Source. Meanwhile, within days, Rossetti’s sister, Christina, had sent him breathless verses in Italian entitled “O Uommibatto”, in which she described the animal as “agil, giocondo” (nimble, cheerful), as well as “irsuto e tondo” (hairy and round). Writing from Scotland a few days later, Rossetti asked his brother William Michael also to thank Christina for the “shrine in the Italian taste, which she has reared for the wombat. I fear his habits tend inveterately to drain architecture … It appears the wombat follows people all over the house!” At last, Rossetti returned to London on September 20, and the next day wrote to William Michael his most famous and suggestive remark about the new addition to his menagerie: “The wombat is a joy, a triumph, a delight, a madness.” Unfortunately, the poor wombat was also an invalid. 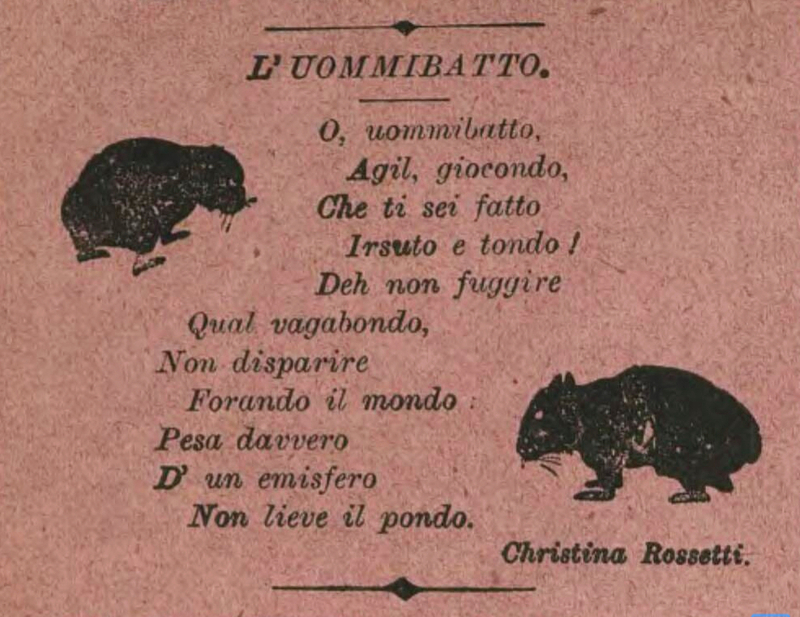 Christina Rossetti’s “O Uommibatto” wombat poem as published in the Sydney paper The Bulletin, Vol. 25 No. 1262 (21 Apr 1904) — Source. Dante Gabriel Rossetti’s self-portrait with his deceased wombat Top — Source. The substitution of the wombat for Lallah Rookh’s exotic gazelle is typical of Rossetti’s self-indulgent humour, and he clearly had no trouble adapting for himself the mood of a lovelorn oriental princess. During its short life, the first of Rossetti’s two pet wombats secured a remarkable place in the mythology of his circle of friends. Rossetti gleefully reported to William Bell Scott on September 28, 1869 that the wombat had effectively interrupted a long and dreary monologue from John Ruskin by patiently burrowing between the eminent critic’s jacket and waistcoat. This must have been a marvellous thing to watch happen. Much later, James McNeill Whistler invented a silly story about how the wombat had perished after eating an entire box of cigars. Ford Madox Brown thought that Rossetti’s habit of bringing the wombat to dinner and letting it sleep in the large épergne or centrepiece on the dining room table inspired the dormouse in the tea-pot incident at the Mad Hatter’s Tea Party in Alice’s Adventures in Wonderland. This is in fact impossible because Lewis Carroll wrote that chapter in 1863, and the novel with its famous illustrations by John Tenniel was published two years later in 1865. 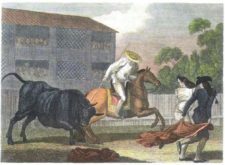 There were also stories circulating about the wombat’s diet of ladies’ carelessly discarded straw hats, and so on. “Mr William Bell Scott Wondering What It is Those Fellows Seem to See in Gabriel”, from Max Beerbohm’s Rossetti and his Circle (1922) — Source. 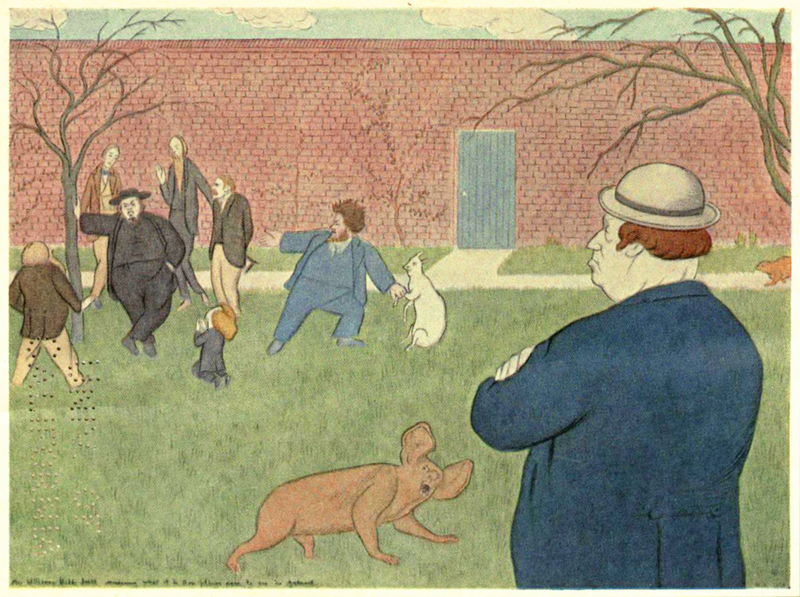 Many years later, recalling the high jinks at Cheyne Walk, Max Beerbohm devised a series of ridiculous caricatures, with the garden menagerie as the setting. 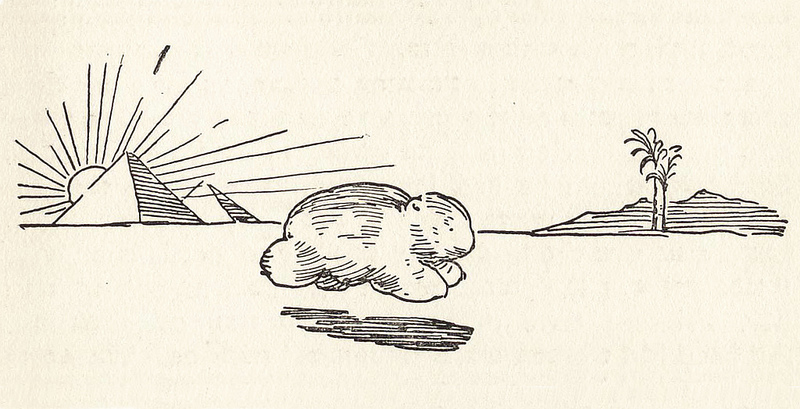 We do not know if this bizarre animal with enormous floppy ears was Beerbohm’s bizarre tribute to the wombat, but it seems possible. In the short term, the Canadian woodchuck made up for Rossetti’s failure to preserve his two pet wombats. The woodchuck lasted much longer. For a long time it was mistaken for the wombat. 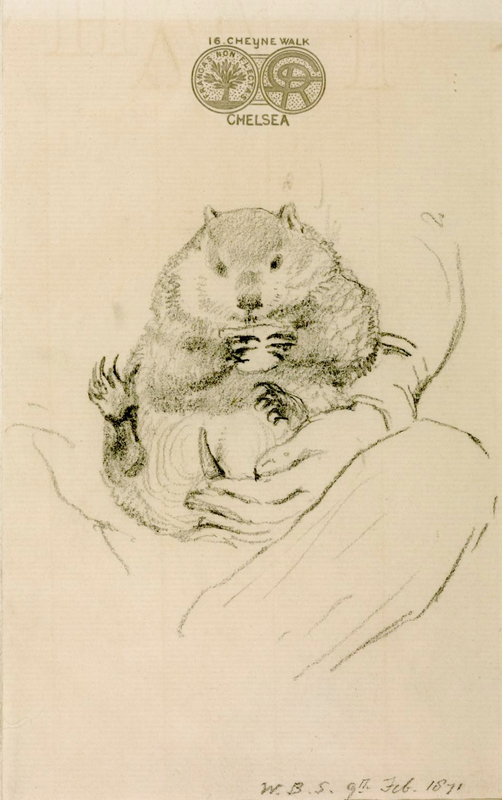 On February 9, 1871, William Bell Scott observed the woodchuck nestling in Rossetti’s lap and made a charming pencil drawing on Cheyne Walk letterhead. He always assumed it was a wombat. I would say that it was, in fact, the woodchuck that slept peacefully in the épergne in the middle of the dining-room table, not the wombat. Rossetti’s Wombat Seated in his Master’s Lap (1871), by William Bell Scott — Source. Indeed it is the very idea of the wombat, not so much the creature himself, that consistently captured the imagination of visitors to Cheyne Walk, and stood out among the various Bohemian props with which Rossetti surrounded himself. The wombat craze of the 1850s and 1860s, while confined to a relatively small group of friends, represents a fascinating by-product of the British colonisation of Australia. Australian birds and animals were very seldom noted in the London press. Palmer’s index to the Times newspaper lists only one reference each to a possum and an echidna in the whole extent of the nineteenth century, while kangaroos are likewise seldom mentioned — though the few mentions are so bizarre that they are worth repeating. a strange animal lying at her back, with one of its paws laid over her shoulder. Screaming with affright, she left her bed, and seizing a towel, she beat it with all her might, when, with one bound, it sprang to the furthest corner of the room, and at length took refuge in another bed which stood in the same apartment. This rather nonchalant kangaroo turned out to have escaped from Mr Wombwell’s Wild Beast Show, which had lately occupied The Mound. Here the animal’s peculiar mode of progression was exhibited in a style which astonished the field—a singular succession of leaps carrying it over the ground at a rate perfectly startling. Those who were well mounted alone were enabled to go the pace, and they speedily found themselves at the top of Leith Hill, where the kangaroo took to the road, and for about a mile and a half they all dashed along, “the field” rapidly augmenting in numbers as they proceeded in their novel chase. By contrast with these rare sightings of kangaroos, as a curiosity in Britain, the wombat, “the most beautiful of God’s creatures”, seems to have attracted far more attention than any other Australian animal, and reached into the recesses of the imagination — at least among that group of artists who in the 1850s and 1860s clustered around Dante Gabriel Rossetti. Angus Trumble is a former Director of the National Portrait Gallery in Canberra. 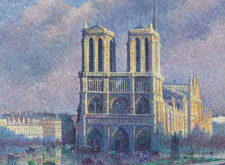 Previously he was Senior Curator of Paintings and Sculpture at the Yale Center for British Art in New Haven, Connecticut, and, before that, Curator of European Art at the Art Gallery of South Australia in Adelaide.